Your Christian Holyland Tour representative will meet you at the airport and take you to your hotel for the night. After you enjoy your breakfast, you’ll drive north to Caesarea Maritima where you will visit multiple sites including the Roman Theater, Herod’s Palace, Palace of the Roman Procurator (Apostles 23: 23 and Apostles 26: 23 – Paul; Apostles 10: 20-48 – Peter and Cornelius), the Amphitheater, the Crusaders’ City and the Harbor. From there you’ll continue to Nazareth and visit the Church of Annunciation (Luke 26: 28) and Mary’s Well (in the Greek Orthodox Church). You’ll end the day with a drive to Cana in the Galilee to see the site of the First Miracle (John 2: 1-11 and John 4: 46-54) and then back to Tiberias for the night. Following breakfast, you’ll embark on a boat ride on the Sea ofGalilee where Jesus walked on the water (Matthew 14: 22-23). The ride ends at Ginnosar, where you can see the Ancient Boat, found nearby, that dates from the time of Jesus. From there you’ll drive to the Mount of Beatitudes (Matthew 5: 7) to visit the beautiful heptagonal church built by the Italian architect Berluzzi. Next on our itinerary is Tabgha, where you’ll visit the Church of the Loaves and the Fish (Matthew 14: 14-34) and the Church of Mensa Christi, where Jesus elected Peter as His Representative on Earth (John 21). From Tabgha, you’ll drive along the north shores of the Sea of Galilee to Capernaum, where Jesus lived in the house of Peter and performed his miracles and healings (Matthew 4: 13, Matthew 8: 14-15). You’ll close out the day by returning to your hotel for the night. After breakfast, you’ll drive to Mount Tabor known as the site of Transfiguration. There you’ll visit the Catholic Church (Matthew 17: 1-8) and enjoy a spectacular view of the Lower Galilee and the Plain of Jezreel from the rooftop. You’ll then drive through the town of Afula, to Megiddo which is also called Armageddon as it’s the place where the last battle of mankind is due to take place (the Apocalypse of St. John). While in Megiddo, you’ll visit the Museum and tour the 5,000 year old city whose Gates date from the times of King Solomon, plus the old Canaanite temples and the water tunnel from the time of King Ahab. Next you’ll journey through Wadi Ara, the ancient road (Via Maris) that connected the old Egypt to Mesopotamia, to Tel Aviv where you’ll visit ancient Yope (Jaffa). It was here in Yope that the house of Simon the Tanner (Apostles 10: 9-16) and the place of the Miracle of the resurrection of Tabita (Apostles 9: 36-43) took place. You’ll wrap up the day with a drive through the Hills of Judea toJerusalem to spend the night. Following breakfast, you’ll ascend the Mount of Olives and visit the Chapel of the Ascension (Luke 24: 50-53), and the Church of the Pater Noster (Luke 11: 1-4). Here you’ll enjoy a wonderful panoramic view of the Old City of Jerusalem and the Temple Mount. Next, you’ll walk down the Mount of Olives to the Church of Dominus Flevit (Luke 19: 41-44) and then to the Garden of Gethsemane to see the place where Jesus was arrested (Matthew 26: 36-58), view the old olive trees and visit the Basilica of the Agony. You’ll walk through the Lion’s Gate into the Old City where you’ll visit the Church of St. Anne and the Pool of Bethesda (John 5: 1-15). From there you’ll walk through the Via Dolorosa along the Stations of the Cross along the remains of the Antonia to the Church of the Holy Sepulcher. After the visit, your walk will continue through the colorful bazaar, wrapping up by returning to the hotel for the night. Enjoy breakfast and then you’ll embark on a drive to Mount Zion to visit the Room of the Last Supper (Cenacle) and the Tomb of King David. You’ll walk through the Jewish Quarter to the Wailing Wall – the holiest place for the Jews – and the Dung Gate, and then drive through the New City of Jerusalem to Ein Kerem to visit the Church of St. John (Luke 1: 1-25). You’ll continue the drive to Yad Vashem to see the Memorial to the victims of the Holocaust. From there you’ll continue on to Bethlehem* to visit the Church of the Nativity (Luke 2: 1-7), Shepherd’s Field (Luke 2: 8-20) and then back to the hotel for the night. First breakfast, then you’ll drive via the Good Samaritan Inn (Luke 8: 25-37) to the mountain fortress of Massada, the stronghold of the Jews in the war against the Romans. You’ll take the cable car to the fortress to visit the palaces of Herod the Great with its Roman baths and pools. Next you’ll descend for a possible “dip” and “float” in the salty water of the Dead Sea, the worlds lowest place. On the way back to Jerusalem , you’ll stop in Qumran -t he city of the Essens – where the Dead Sea scrolls were found in a cave by a shepherd. You’ll end the day back in Jerusalem at your hotel for the night. You will be met by your Christian Holyland Tours representative and transferred to your hotel in Tel Aviv.. Your tour begins with a drive to the Mount of Olives for a panoramic view of the city, followed by a visit to the church of All Nations, King David’s tomb and the room of the Last Supper on Mt. Zion. 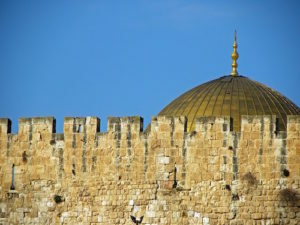 Next you’ll enter within the walls of the city and visit the Cardo, Temple Mount (note that entrance to the mosques are not included), Western Wall, Via Dolorosa, the Church of the Holy Sepulcher, the oriental Bazaar and the Garden Tomb. You’ll end the day by returning to your hotel in Jerusalem. After your visit to Ein Karem to see the Church of Visitation, you’ll continue on to Yad Vashem, to visit the memorial to the holocaust, the Israel museum, the shrine of the book, where the dead sea scrolls are housed, and the miniature model of Jerusalem as it was during the second temple period. Next stop is Bethlehem* to visit the Church of Nativity and then back to your hotel in Jerusalem. Today you’ll begin by driving to Qumeran and visiting this ancient city where the Dead Sea Scrolls where found. After that you’ll drive along the shore of the Dead Sea, the lowest place on earth, to Massada, the last stronghold of the Jews after the destruction of the Second Temple in 70 A.D. You’ll ascend Mt. Massada by cable car and visit Herod’s Palace, the food storerooms, and water irrigation system. When finished you’ll descend by cable car and return to Jerusalem for the night. Today you’ll leave Jerusalem and drive through the Jordan Valley to the newly excavated city of Beit Shean to visit the Roman theatre. Next, your drive continues to Yardenit, the baptismal site on the Jordan River and then on to Nazareth via Cana of Galilee. Here you’ll visit the Church of Annunciation, St. Joseph’s workshop and Mary’s well. After that you’ll head to the Kibbutz Hotel for the night. After a short tour of Tiberias, you’ll enjoy a boat ride to Capernaum where you’ll visit the remains of a 2nd century synagogue. Next is Tabgha, the site of the miracle of fish and loaves, and a visit to the Church of Multiplication with its 4th century mosaic floor. From here, it’s off to the Mount of Beatitudes, the place where Jesus delivered the Sermon on the Mount, followed by a rive to the Banias Springs and waterfalls and a tour of the Golan Heights. You’ll then return to the Kibbutz Hotel for the night. After breakfast, your first stop of the day is a drive to Acre to visit the ancient city and harbor. Next, you’ll continue on to Haifa to view the Persian Gardens at the Bahai Temple and then it’s off to Megiddo. In Megiddo, identified as the site of Armageddon, you’ll visit the archeological excavations including the well-preserved water supply system and then continue your drive to Caesarea , the capital of Judea under the Romans. Here you’ll get to visit the excavations of the ancient city, the Roman Theatre and aqueduct. Your drive then continues along the coastal plain to Tel Aviv where you’ll be spending the night. Your Christian Holy Land Tours representative will help transfer you from the hotel to Ben Gurion airport for your flight home.